What is one tiny thing that can ruin an entire day? Wet socks. There are very few sensations less comfortable than being wet. Whether you’ve been caught in a rainstorm, stepped in a puddle, or just had to throw on some clothes before they were fully dry, living the damp life is less than enjoyable. Traveling when wet is even worse. When you are on the road and your wardrobe is limited, it is almost a guarantee that at some point, an item you are forced to use or wear is going to be wet and uncomfortable. But instead of carting an umbrella or want more than just a rain jacket with you all over the world, why not spend some time and money waterproofing yourself and your gear? Below are the three best waterproof gear items that absolutely every traveler should invest in. Some things just need to be done the right way. In this case, your waterproof boots, socks, and dry bags should all be purchased that way. After that, there are a few waterproofing sprays and products that promise to turn any item you own into a water-wicking machine. Never let the rain clouds scare you away again and invest in these. Duck boots are fashionable yet practical travel footwear. 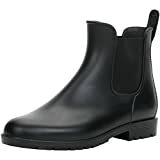 They are waterproof without being cumbersome, which makes them a fantastic option for anyone visiting a particularly rainy city (Seattle, anyone?). This way, you won’t have to step carefully, wring out your socks at the end of the day on the town, or just generally walk around in squishy shoes. 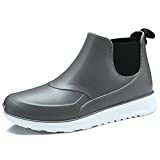 Waterproof shoes are almost always a good investment, since in any given wet environment; your feet are usually the first things to get soaked. There are even some super fashionable duck boots out there now that closely resembles walking shoes. That way, you won’t have to feel like a child walking around in their galoshes. If wet feet are really something that you absolutely cannot stand, then invest in these waterproof socks to go under your duck boots. That way, there is still a barrier between any weak seam or large splash and your skin. 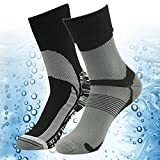 These socks consist of 74% high waterproof nylon, 23% lycra, and 3% elastane. The lining is made of 64% coolmax, 3% lycra, and 33% elasatane. That means they are all but watertight, but still breathable and comfortable. There is even an ultra-light cushion on the sole that provides comfort and improves the fit. If you want to avoid damp, squishy feet on your next trip, then you really can’t go wrong with these socks. 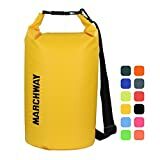 If you are seriously concerned about some of your items getting wet like your smartphone or laptop and cannot guarantee that you will be in a dry environment, then bring along this dry bag. This rolltop dry bag will keep everything inside of it bone dry – and it even floats. If you are planning on a boating trip, a beach trip, or any other kind of activity that may result in a lot of water going absolutely everywhere, make sure your valuable and delicate items are kept safe with this bag. It comes in five different sizes: 5L, 10L, 20L, 30L, and 40L, and offers 12 different bright and distinct color options. It is made of ripstop tarpaulin and features sturdy welded seams, all of which guarantee that not even a drop of water is getting in. If you are visiting a rainy or wet location and don’t want to deck yourself out in raincoats or galoshes the entire time, make sure that all of your luggage and clothing items are at least partially water-proofed with this bottle of Scotchgard. 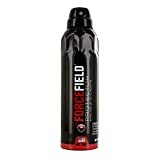 All you have to do is spray down your favorite shoes, jackets, and bags with this incredible little spray, and a few hours later your items will repel moisture during use and storage. This is great for anyone visiting a winter location as well, as snow can quickly melt on you to create an un-fun damp sensation. Do yourself a favor. The next time you are even a little worried about snow or rain, Scotchgard your favorite items and don’t even worry about moisture or water damage. 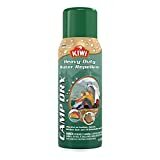 This is a fantastic spray to use if you are going camping. The tough silicone protection will keep your outdoor boots and gear safe from unwanted moisture. The spray bonds to the fibers of fabric and leather to create a nearly impenetrable water barrier that is still malleable and breathable. According to the manufacturer, it is ideal for tents, tarps, boots, hunting apparel, outdoor gear, boat covers, and more. This the backpacker or outdoorsman’s best friend. Without it, your clothes and gear are bound to get wet and uncomfortable quickly. So don’t take the risk. Pick up one of these spray bottles and make sure everything you’ve got is water-tight and protected. This water-repellent spray offers an invisible coat that protects your gear from UV fading and yellowing along with excess water. Just one application will last you up to 12 months. Spray down your favorite shoes and clothes, and watch the water bead on the surface of your items without sinking into the fabric or material. Investing in waterproof gear can be well worth it if you are traveling to some of the wetter environments. It will not only protect your other items, but it will also keep you from aches, illnesses, and odors that sometimes come with damp clothing and shoes. Consider the items above and enjoy the scenery.